The white polo went away because of quality issues - the emblem was silk-screened, and didn't suffer repeated washings well, and it was white - got dirty quickly, and needed washing more often. The guayabera was ugly. For all its comfort, it didn't really fit in as a uniform. It was even too informal to go with the polo crowd. Being a medium dark blue, it still had heat issues. >any< of the field uniforms. The same goes for cold-weather gear. have solved heat and similar issues. Shorts, advanced fabrics with vented panels, etc., etc. and affectation of military appearance. or how they are configured and worn. Never thought I'd find a use for these pics. A white polo and white guayabera, at a cutting edge, computerized mission base! Is that a computer or a microwave? 1 - I owned that shirt. 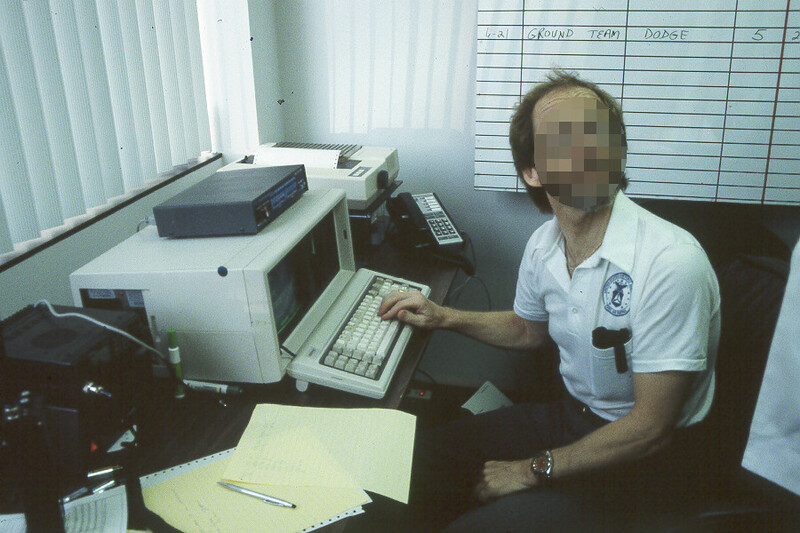 2 - I owned that PC. 3 - I owned that printer. Bonus. I also owned that pen, but it was a nice pen. Uuummm... not really. It's all about frequencies/wavelengths. I know, these responses were somewhat in a light-hearted attempt. For what it may be worth, and I do not know if this is still true, but the Guayabera was seen a great office wear in some Hispanic countries some time ago. More dressed up to work than wearing a polo to work that some here praise so much. CAP called it the Summer Shirt, which was initially available in dark blue. Later they added a white version. The blue one went away around 1991, and then there was just the white one. It was worn in the late '80s and early '90s. Eclipse, what were you doing in CAP at the time of the photos ya posted? when I moved to Group staff. A few missions and lots of weekly meetings and not much else. Once I moved up all bets were off from there. "U.S. Air Force Staff Sgt. Kedwin Alvarado-Cortes, Security Support Squadron vehicle control officer, assists Senior Airman Justin Reeves, 377th Security Support Squadron vehicle control officer, with operational camouflage pattern uniforms and gear issue at Kirtland Air Force Base, N.M., April 23. All defenders on Kirtland will wear the OCP uniform starting May 1." I'll be out by the time it gets fully implemented. You know, I can see the cops wearing it in CONUS. But why is SSgt Billy Bob, who is a Jet Engine Mechanic over in the Test Cell, need to wear camo? It can be issued to him in the Deployment Line if he needs it when he gets deployed. Just like they do right now. Do you mean camo in general or OCPS? If it's the former I agree (FWIW), the latter because the entire service will be in them by year's end. Last time I checked, the Blue BDU's were a lot cheaper then the OCP uniform. 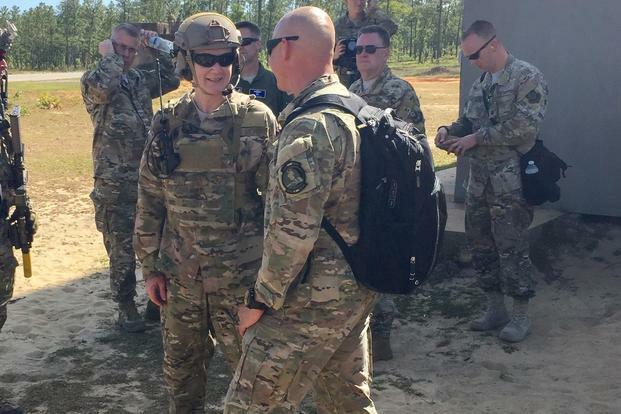 "Something.. something.. 'second class citizen' something.."
"HURLBURT FIELD, Fla. -- As the U.S. Air Force debates switching from its Airman Battle Uniform (ABU) to the Army's Operational Camouflage Pattern (OCP) uniform, troops here gave Air Force Secretary Heather Wilson a sneak peek into the possible replacement's fit and function. Wilson changed into an OCP-pattern uniform Thursday before attending a mission demonstration by an Air Force Special Operations Command special tactics team at Hurlburt and Eglin Air Force Base's training ranges."